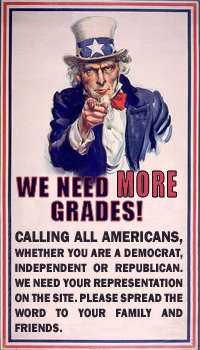 I gave you a grade of C.\\\\ SENATOR: YOU CAN IMPROVE YOUR GRADE AVERAGE IN THE NEXT 4 YEARS IF YOU HELP US IMPEACH OBAMA. DO THE RIGHT THING, SENATOR. I gave you a grade of D. Because you failed to hold the Democrats to include Fredduie and Fannie in the Wall Street Fix joke... you are not willing to filibuster bad bills and are unable to hold the two Maine Rinos to Conservative values. I gave you a grade of F. This time because you lied to Dr. Dobson. What a loser you are? Have you no principles at all? I will work tirelessly against you when you come up for reelection. You have betrayed your public trust. I gave you a grade of D. Senator McConnell,Please do something for the American people instead of just covering the backsides of politicians. Please stop the Unanimous Consent Agreements and STOP the Healthcare Bill in it's tracks. Please ! I gave you a grade of B. Mitch I gave you a B because you don't stand up and voice your opinion for WE THE PEOPLE as you should.